Vincotto is cooked wine and is derived from cooking the musts of Negroamaro and Malavasia grapes. The Fig Vincotto is crafted by the infusion of fig after the 3rd year of aging. The vincotto is aged in oak barrels for up to 4 years, creating a balance between sweet and sour flavors, of course hints of fig. The product does not contain any alcohol, colorants or preservatives. 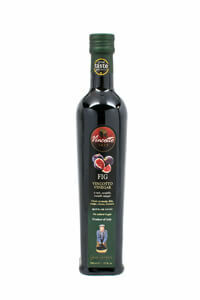 Fig Vincotto Vinegar is wonderful over grilled meats, fish, soups, cheese, fruit salads and ice cream. Ingredients:Cooked grape must, vinegar, figs.